Since Shell and PTTEP from Thailand were competing to take over Cove Energy (Cove), Shell had made a first offer based on $0.195 per share, representing $1.57 billion capital expenditure for the acquisition. Then PTTEP submitted a $1.78 billion cash counter offer valued on $0.220 per share. Then Shell came back with a proposal based on $1.8 billion in cash to acquire Cove. Shell‘s decision to announce a recommended offer for Cove fits with Shell‘s strategic aim to drive forward with its investment programme to deliver sustainable and profitable growth. 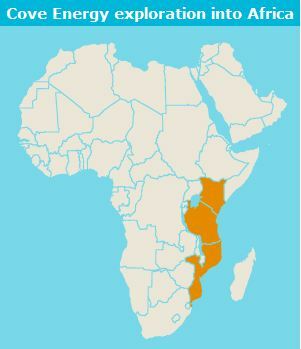 The proposed acquisition of Cove’s portfolio would mark Shell‘s entry into exciting new hydrocarbon provinces, in Mozambique and Kenya, with – 2 – significant potential for new Liquefied Natural Gas (LN from recent gas discoveries offshore Mozambique, and further complementary exploration positions in East Africa. Adding Cove‘s assets to Shell‘s portfolio would strengthen and further diversify Shell‘s existing global LNG portfolio of production and development projects. These discoveries have precipitated an appraisal and testing programme aimed at achieving a final capital expenditure decision on a LNG project by Q3–2013. The current estimate for the resource potential is some 12 trillion cf of gas and planning is already underway to evaluate the commercialization of a project utilizing a minimum of 6 trillion cf in a single LNG Train project. 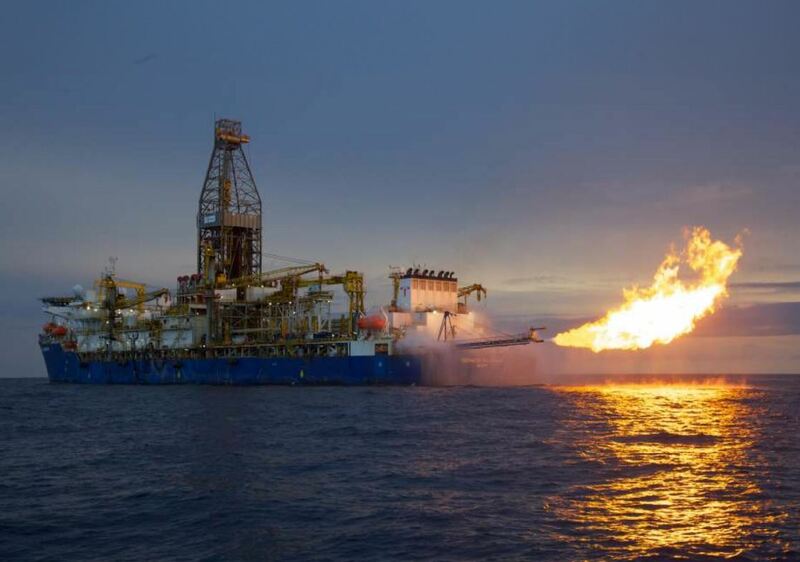 The Windjammer well is located some 50 km off the coast of northern Mozambique in approximately 1,450 m of water. The well reached total depth at approximately 5,130 m and was plugged and suspended in March 2010. The Barquentine well which is located two miles northeast from the Windjammer discovery. 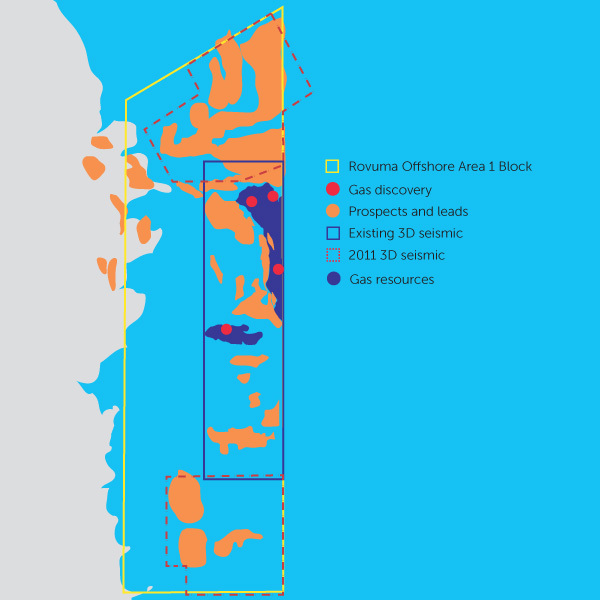 Barquentine was drilled to a total depth of approximately 5,115 m in water depths of approximately 1,575 m.
The Lagosta well was announced in November 2010, it is located approximately 28 km to the south of the Barquentine discovery and 25 km to the southeast of the Windjammer discovery. Lagosta was drilled to a total depth of approximately 5000 m, in water depths of approximately 1,540 m.
The Tubarão well is located some 26 km southwest of the Lagosta drill site. The well was drilled to a total depth of approximately 4,200 min water depths of approximately 900 m and was plugged and suspended in February 2011. The well bore at Tubarão was preserved by the partnership for potential utilisation in future testing.